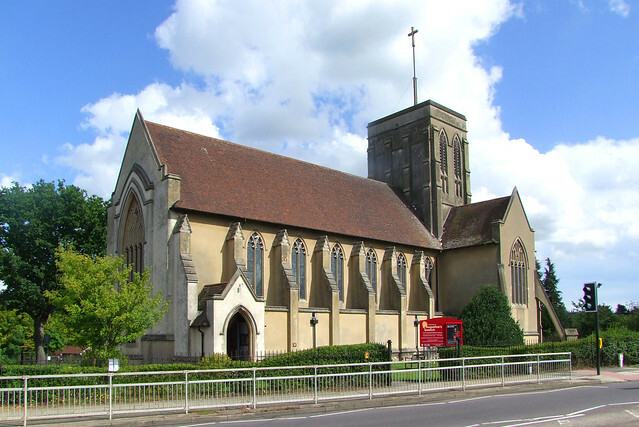 St Augustine, a familiar landmark to drivers in east Ipswich, was the work of diocesan architect Henry Munro Cautley. Cautley was born at Bridge in Kent in 1876, but when he was eight years old his father Richard was appointed minister at Ipswich's new All Saints church in Chavallier Street. Cautley would spend the rest of his life in Ipswich. 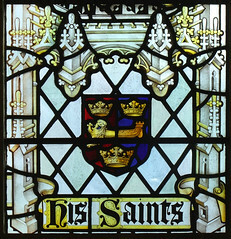 He is most famous today for his epic literary works on Suffolk and Norfolk churches, but as well as being diocesan architect he was a partner in an Ipswich practice with Leslie Barefoot. His best building on his own is the red brick Ipswich County Library, and their best together is probably the Walk, an Elizabethan-style shopping arcade near to Ipswich's Corn Hill. Cautley was also retained by Lloyds Bank, and designed a number of improbably Classical banks for them in the 1920s, mostly in the east of England. Cautley and Barefoot's practice was based at Cornhill Chambers in the Thoroughfare, and the building survives today with Cautley's lettering above the entrance. 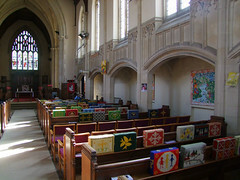 The same lettering can be seen on the war memorials he designed, of which about half a dozen can be traced in parish churches in the Ipswich area. 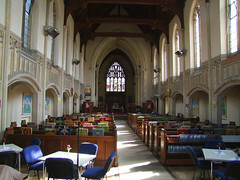 As diocesan architect, Munro Cautley designed three churches for Ipswich. St Augustine was the first, in 1927, bankrolled by Ipswich shop owner Charles Bantoft in memory of his mother. 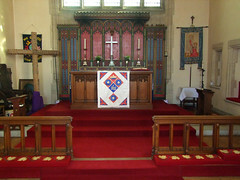 The site was donated to the diocese by Lady de Saumerez of Shrubland Hall. 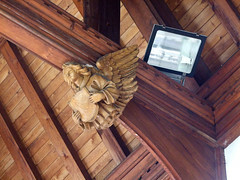 All the work was carried out by firms based in Ipswich, the main contractor being Charles Green & Sons of St John's Road. 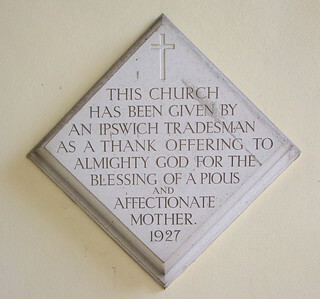 Like many Ipswich builders, Green was a Methodist, and it is said that his honesty after discovering he had underestimated costs led to the firm making just £20 profit on the two years they spent on the project. 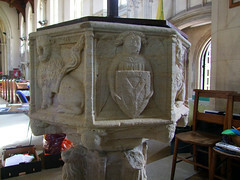 Cautley observed the letter of the Perpendicular style rather than its spirit, and there is a central tower, thus not really Suffolk Perpendicular at all. Perhaps his eyes were wistfully remembering the great cruciform churches of his childhood in Kent. The brick walls are rendered, the tower is concrete. Grander than his St Andrew, Britannia Road, it has none of the spirit of its age that you find at its 1930s near neighbour All Hallows, Landseer Road, where Cautley was on top form both inside and out. Internally, pretty much all is Cautley's, the narrow aisles set behind Perpendicular arcades with panelling reminiscent of Lavenham. There should be the feel of a grand urban church of the late 15th Century, but the lack of clerestories and the narrow aisles miss the trick, and the eye is drawn eastwards rather than upwards. 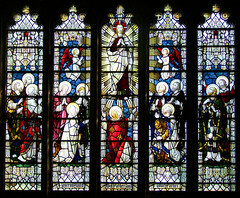 The anonymous feel of the nave enhances the beauty of the chancel, where steps climb to Cautley's altar and reredos, with Horace Wilkinson's excellent five-light window depicting the Ascension of Christ. The interior would seem rather stark without it. 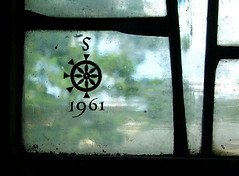 In 1936, Wilkinson came back and installed the three-light window in the south transept. 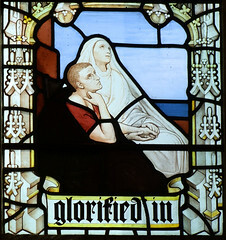 It depicts the Blessed Virgin and Child flanked by St Monica and St Augustine. Beneath, a charming little vignette depicts the church's donor Charles Bantoft and his mother as St Augustine and St Monica. A plaque beside the window remembers their donation, but does not name them. The tower contains the bell from the now-vanished church of Linstead Magna, which was derelicted the year before St Augustine was built. Supposedly, the font is from there, too. But it seems possible that the Linstead Magna font was actually moved to Linstead Parva church, and Diocesan architect Cautley pressed the rather finer Linstead Parva font into service at his brand new church. 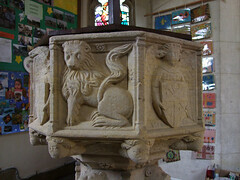 The font currently at Linstead Parva has a face which was once set against an arcade, but Linstead Parva church has no arcades. 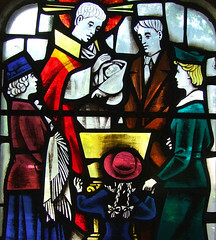 Behind the font is a lively little window of 1961 by Harry Stammers depicting an infant being baptised, the family and godparents gathered around. It is very much in the familiar Festival of Britain style of the York school of .stained glass artists. What Henry Munro Cautley would have thought of it we don't know, of course, because he died at home in Ipswich in 1959. His gravestone is in Westerfield churchyard - he designed it himself. His wife Mabel, who had died the previous year, is buried in the same grave.